It’s official, Kimberly Guilfoyle is leaving FOX News after 12 years and will join the pro-Trump PAC America First as Vice-chair woman. Kimberly Guilfoyle tweeted, “Today I have a bitter-sweet announcement. I’ve decided to leave Fox News Channel and dedicate myself full time to joining America First as Vice Chairwoman, campaigning across the country and firmly standing with President Trump.”We wish her well, she will be a great asset to the GOP’s midterm election chances and the reelection of Trump in 2020. Fox News says host Kimberly Guilfoyle is leaving the network, amid reports that she’s about to take on a new role with a super PAC supporting President Trump’s agenda. Guilfoyle has been one of the co-hosts of the network’s afternoon show “The Five” and has been dating President Trump’s son Donald Jr.
A Fox spokeswoman confirmed her departure Friday. She was considered for White House press secretary last year after Sean Spicer departed the administration. 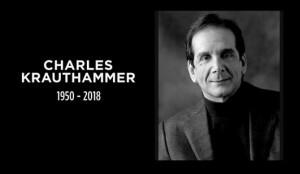 Charles Krauthammer, a longtime Fox News contributor, Pulitzer Prize winner, Harvard-trained psychiatrist and best-selling author died Thursday at the age of 68. This one really hurts. Sadly this was not unexpected. 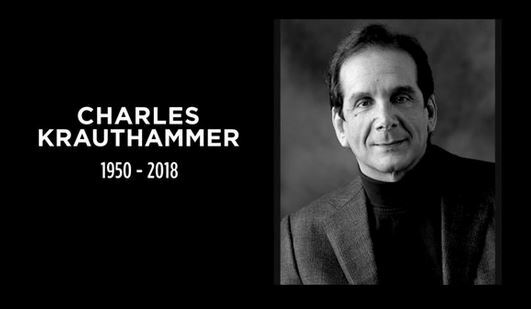 Just a couple weeks ago Charles Krauthammer told the world that he only had weeks to live. Krauthammer wrote, “My doctors tell me their best estimate is that I have only a few weeks left to live. This is the final verdict. My fight is over.” Unfortunately, a great man has passed away and lost his battle with cancer. This one is personal. It’s not like a death in the family, it is family. His commentary has brilliant, whether you agreed with him or not. He was not afraid to let you know his opinion. And as a Conservative, I did not always agree with Charles, but I always respected him. That should be a lesson to America, we don’t always have to agree. Charles will be so missed, that I can’t even begin to put into words. With all that was against him in life dealing with his disability, Charles lived life to the fullest and accomplished so much. As Charles penned in his final letter to all of us, “I leave this life with no regrets. It was a wonderful life full and complete with the great loves and great endeavors that make it worth living. I am sad to leave, but I leave with the knowledge that I lived the life that I intended.” Rest in Peace my friend. The liberal MSM can claim all they want that some how uber-lib Rachel Maddow of MSNBC is on the same level as those at Fox News like Sean Hannity; however, they would be lying and that would be more fake news. The Fox News Channel is #1 and it is not even close. 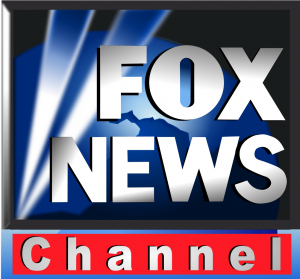 According to Nielsen Media Research for May 2018, FNC was #1 for the 197th consecutive month, and Fox News destroyed its competition, with an average total audience of 2.381 million viewers, compared to MSNBC’s 1.384 million and CNN’s 835,000. Also, Fox News had 10 of the top 15 shows in cable news, with Sean Hannity taking the title of highest-rated host in cable news. Hannity had an average total audience of 3.261 million, followed by MSNBC’s The Rachel Maddow Show (2.627 million), and FNC’s Tucker Carlson Tonight (2.617 million), The Ingraham Angle (2.617 million) and The Five (2.153 million). Keep in mind that FNC completely changed their prime time line up and said good bye to the Bill O’Reilly and Megyn what’s her name and added Tucker Carlson and Laura Ingraham. They not only did not miss a beat, they got better. What happened to the rise of MSNBC? After showing historic growth–and a few months in 2017 when Rachel Maddow took the title of most-watched host in all of cable news, beating Fox News Channel’s Sean Hannity–the just-released results of the May ratings period look very familiar:Fox News won–everything. In prime time, Fox News destroyed its competition, with an average total audience of 2.381 million viewers, compared to MSNBC’s 1.384 million and CNN’s 835,000.Among viewers 25-54, the group most coveted by advertisers, FNC shook off a challenge in recent months from MSNBC to claim a clear victory: 461,000 viewers, well ahead of MSNBC (329,000) and CNN (265,000). So how could FNC possible beat all their liberal cable competitors when we have been told there is a “blue wave” of liberal discontent?